Performed at The Thick House. Turning Tricks written by Silva Semerciyan and Counting in Sha'ab written by Emma Goldman-Sherman directed by Erin Gilley. Two British couples enjoy a laugh in a theatre bar in London in Silva Semerciyan’s Turning Tricks, directed by Erin Gilley (L to R: Naseem Etemad, Lawrence Radecker, Denmo Ibrahim, Adam Roy, Emily Keyishian). British Jasmine scolds her Moldovan slave Yuliana as others look on in a theatre bar in London in Silva Semerciyan’s Turning Tricks, directed by Erin Gilley (L to R: Roneet Aliza Rahamim, Emily Keyishian, Denmo Ibrahim, Naseem Etemad, Adam Roy). 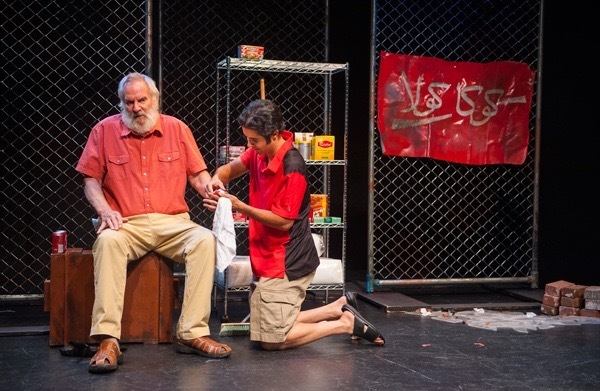 Khoresh (Damien Seperi, right) helps Iraqi grocery store owner Abu Omar (Julian Lopez-Morillas) after a bomb goes off outside of his store in Emma Goldman-Sherman’s Counting in Sha’ab, directed by Erin Gilley. Ali (Abdulrahim Harara, left) speaks to Khoresh (Damien Seperi, center) as Abu Omar (Julian Lopez-Morillas) cleans his store after a bomb goes off outside in Emma Goldman-Sherman’s Counting in Sha’ab, directed by Erin Gilley.